CAN Recover was inspired by the experience of its founders and the realization of a communal need. Both Aaron and Mike battled post-concussion syndrome for up to 2 years and were withheld from returning to the sports they love. Through their experiences, they realized that there is no effective support available for student-athletes like themselves. Seeing how much impact they had on each other’s recoveries by providing empathetic support, they immediately wanted to start helping others overcome the physical and emotional challenges of a prolonged concussion recovery. Aaron grew up as the youngest of three in a family of athletes. Growing up and playing every sport with the high-schoolers that his parents coached, Aaron was immediately attached to hockey and grew into lacrosse when his family moved to Rye, NH at the age of 12. 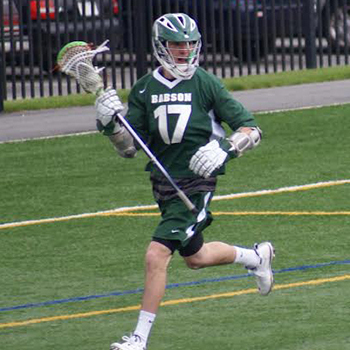 Aaron ultimately went on to play Division III lacrosse at Babson College. After undergoing a five month recovery from a concussion sustained on October 7th in his sophomore year, Aaron was fortunate and eager to return to the field. Junior year fall ball was off to a good start until exactly one year since his last, he was diagnosed with another concussion on October 7th, 2012. Between missing weeks of school (even though being told to drop the remainder of the semester), having to make the decision that he would not return to lacrosse, and dealing with the social inability to spend time with friends, the early stages of the recovery were very difficult to cope with and led to swings of depression. Four months into Aaron’s recovery, his brother introduced him to Mike. Mike had been in the midst of a prolonged recovery himself. The two realized common ground in the challenges they were facing, both physical and emotional. Since Mike had been going through it for quite a few months longer, Aaron was able to learn from Mike and what he had been through so far. The day Aaron had Mike available as a support outlet marked a significant milestone in Aaron’s recovery. A recovery that stretched roughly 18 months (although some aspects still impact his day-to-day life). Mike was born and raised in the Chicago area and played just about every sport he could get to fit in his schedule. As he entered high school, he decided that he wanted to be a Division I college hockey player. After stops in Grand Rapids, Michigan and Pembroke, Ontario, Mike was recruited to play for the United States Military Academy at West Point. He played 53 career games over two seasons at Army before retiring as a result of post-concussion syndrome. Mike estimates that he has had 8 concussions over the course of his career, many of which he failed to treat properly (which he believes caused the severity of his later injuries). His last concussion, suffered in May of 2011, was followed by 24 months of post-concussion syndrome–a long window of headaches, fogginess, depression, memory issues, and cognitive difficulties, amongst other symptoms. 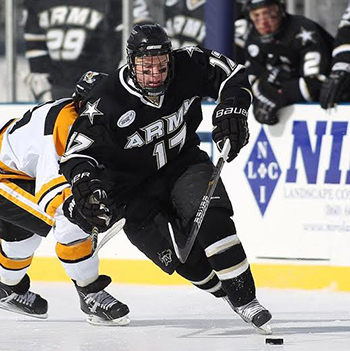 This prolonged concussion recovery made it that much more challenging to remain on track with USMA’s academic and physical demand. Mike’s difficulties during these months are what inspired him to reach out and help others facing similar challenges. He was introduced to Aaron by one of his Army Hockey teammates, Aaron’s brother. And while Mike was able to provide support for Aaron, he himself noticed a positive impact on his recovery, particularly the mental aspect.